Winter is upon us: Not only does the cold induce shivering, but the freezing temperatures also wreak havoc on our skin. In the case of another polar vortex, it takes more than just a thicker moisturizer to combat cracking, itching skin. Read on to learn how to protect skin from the inside out. We break down how to deal with your winter woes! Now is the time to swap out harsh acne cleansers for something more gentle (zit-zapping ingredients dry out skin even further). Reduce exfoliation and limit spot treatments to three times a week; irritation can increase with dryness. Exfoliating will remove dead skin cells and flakes, allowing lotion to sink in, but too much will do more damage than good, so alternate with a gentle cleanser. 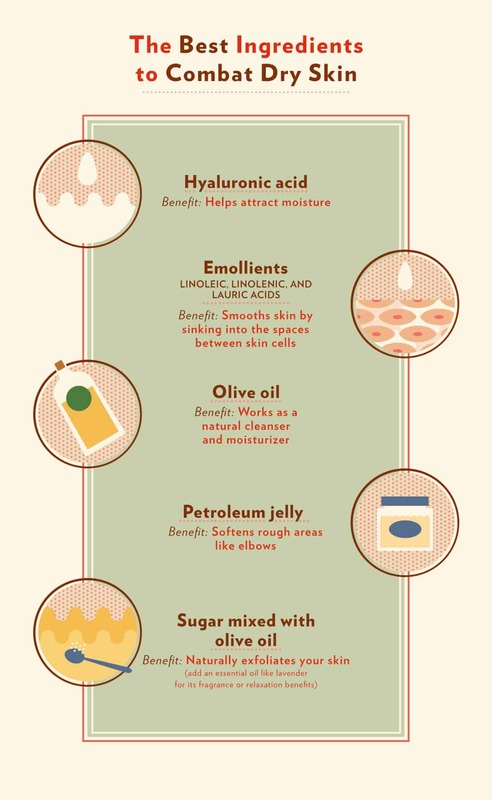 Minimize the use of soaps on the face or body since they’ll strip skin of its natural oils. Opt for moisturizing body washes instead. For acne prone skin, don’t fear moisturizers. Look for gentle lotions with hydrating ingredients like hyaluronic acid, a substance that is naturally present in the body and even aids in healing wounds. Swap light, summer moisturizers for something creamier that will create a barrier from the blustery weather. For oily skin, choose a face oil—even if your skin is oily. The essential fatty acids hydrate and protect skin against extreme temperatures. Lastly, although it’s winter, don’t forget sun protection to hydrate and soothe your face. since the UV rays are just as strong in the winter and reflect off of snow. Besides your skincare regimen, drinking plenty of water provides skin a hydration boost from the inside out. Going from the frigid cold outside to a heated apartment or office inside can also damage complexion. Try putting a humidifier in the bedroom to increase moisture levels in the air and decrease dryness (and stuffy noses!) You’ll also benefit with one in your office, but if it’s not possible, a few plants in your home or office add moisture. Like the rest of your skin, the scalp also suffers from dryness. It’s not just the sun and chlorine of summer that’s tough on hair; cooler temps can cause the scalp to peel and flake, leaving strands dull. Try a dandruff shampoo to eliminate flakes in a few weeks; look for one with tea tree oil, a moisturizing and antifungal ingredient that will prevent the overproduction of skin cells. Slightly altering your hair routine can bring back life to your roots as well. Shampooing daily can dry out both hair and the scalp, so scale back and opt for dry shampoo instead. Make sure to use a heat protectant when blow drying or styling to fend off even more dryness. No matter how well we cover up against the wind, our lips always seem to suffer. Even if they are cracked and peeling, avoid biting or picking lips since this will slow down the healing process. Instead, use a gentle lip exfoliant at night and finish with a thick coat of lip balm. A dry toothbrush, with gentle sweeping motions, will also slough away dead skin and leave lips smooth. Look for a balm with SPF, vitamin E, and shea butter or petrolatum (an ingredient that’s also good for other cracked areas, including elbows). And don’t worry if you find yourself applying it frequently; Contrary to some rumors, you can’t actually get addicted, though ingredients such as menthol may be irritating and increase the impulse to apply more. Winter’s lack of moisture can lead nails to break, split, or chip. The next time you reach for that hand cream—and you should make a habit of doing so every time you wash your hands—massage some into your nails as well. Using nail polish removers and washing dishes will only increase the drying effects. Coat nails with cuticle oil once a week and wear rubber gloves when cleaning dishes. Follow these tips and your skin will be ready when spring rolls around!